A paraphrasing of a poem I came across on a poetry web site (by CEFord, Nov 2013, Wanderlust, hellopoetry.com/poem/506964/wanderlust/). The idea as I read it was the taste of "icy air," and the wonder of the forests and wildflowers...all that the eye could see and the fingers could touch. Anywho, a nice thought as I worked on this image captured in the Okanogan-Wenatchee National Forest while waiting at the Bridge Creek Trailhead. 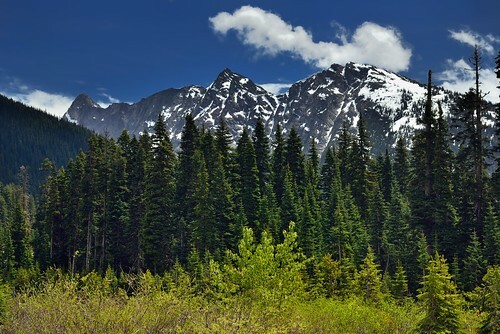 This is a view looking to the southeast to snowcapped peaks of Stilletto Peak, Jackknife Peak, Switchblade Peak and other peaks of the South Washington Pass.